Not every classic photo has to be well composed, rich in colour and texture. Today’s classic photo for example. This here is the night that my little brother Phil (front left) celebrated the birth of his baby girl Charlotte. 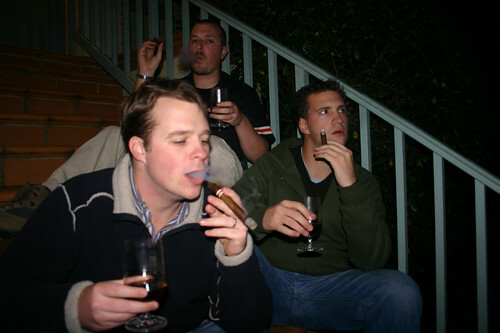 A fantastic day that day, a fantastic night that night, a pretty good cigar & nice port, and finally a badly composed and underlit, yet classic photo to mark the occasion. We had a Boy in the same hospital on the same night (or near on the same night). I may have been enjoying the same activities on the same night elsewhere. Great pic. Wish I could post this pic’s Bizarro on my site. But we do not have a good pic.